LED ceiling lamp ML300 with motion sensor, 15W, 220VAC, 900lm, 6500K, cool white, BC15-00330 Round LED sensor ceiling fixturer from Braytron with power consumption of 15 W, light flow 900lm and cool white color. Suitable option for covered balconies, entrace halls, stairs areas and corridors.With PIR motion sensor and driver included. For dry confitions only (IP20). LED wall light AVVA-WL01, round, 8W, 220VAC, 400lm, 3000K, warm white, IP20, non-waterproof, BH07-03000, white Minimalistic, LED sconce AVVA from Braytron with power consumption of 8W and gentle warm light. Ideal solution for interior lighting at home, lobby, galleries, hotels, restaurants and home area. Suitable for dry conditions IP20. Warranty 2 years. LED wall light AVVA-WL01, 8W, 220VAC, 400lm, 3000K, warm white, IP20, non-waterproof, BH07-03001, black Black, LED wall light AVVA (wall sconce) from Braytron BH07-03001 with power consumption 8W, 400lm luminous flux and gentle warm light 3000K. Ideal solution for decorative lighting in hotels, galleries, coffee shops and home area. For indoor use only IP20. Waterproof LED sensor ceiling lamp JADE 18W, round, 220VAC, 1440lm, 3000K, warm white, IP44, BH15-01100 Round, waterproof ceiling sensor fixture Jade from Braytron PLUS with wattage 18W, flux 1440lm and soft, warm white lighting. Suitable for moiture and dust conditions IP44. Wide application in halls, corridors, balconies, workshops. Non-dimmable. Energy class A+. 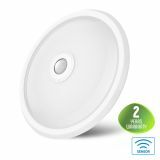 Waterproof LED sensor ceiling lamp JADE 18W, round, 220VAC, 1440lm, 6500K, cool white, IP44, BH15-01130 Round, waterproof ceiling sensor fixture Jade from Braytron PLUS with wattage 18W, flux 1440lm and bright, cool white lighting. Suitable for moiture and dust conditions IP44. Wide application in halls, corridors, balconies, workshops. Non-dimmable. Energy class A+. Waterproof LED ceiling lamp JADE 20W, round, 220VAC, 1440lm, 3000K, warm white, IP44, BH15-02100 The LED ceiling lights PLUS series of Braytron are innovative LED lights with a modern and stylish design. This BH15-02100 LED ceiling lamp is with low power consumption that makes it the ideal replacement for traditional incandescent lamps. LED Ceiling lamp JADE, round, 20W, 220VAC, 1280lm, 6500K, cool white, IP44, waterproof, BH15-02130 The LED ceiling lights PLUS series of Braytron are innovative LED lamps with a modern and stylish design. This BH15-02130 LED ceiling lamp is with low power consumption that makes it the ideal replacement for traditional incandescent lamps. Waterproof LED ceiling lamp JADE 30W, 220VAC, 2060lm, 3000K, warm white, IP44, BH15-02200 Moisture-proof LED dome light JADE from Braytron PLUS with power consumption 30W, luminous flux 2060lm, protection degree IP44 and soft, warm white lighting 3000K. Suitable for both indoor and outdoor installation. Ideal for wet areas, bathrooms, balcony, gardens. Waterproof LED dome lamp JADE 30W, round, 220VAC, 2060lm, 6500K, cool white, IP44, BH15-02230 Waterpoof, round LED ceiling lamp (dome light) JADE with power consumption 30W, luminous flux 2060lm, protection degree against moisture IP44 and cool white lighting. Suitable for indoor and outdoor installation at bathroom, WC, garden, balcony, deck areas. 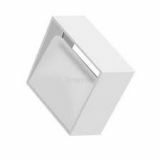 LED wall light AVVA-WL01, 8W, square, 220VAC, 400lm, 3000K, warm white, IP20, non-waterproof, BH07-03100, white Square shaped LED wall light from AVVA series from Braytron in white color, with 8W power consumption, 400lm light output and gentle, warm white light. 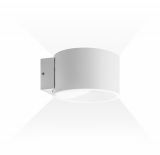 This wall fixture is an ideal solution for decorative lighting for hotels, stairs, corridors, bedrooms, galleries and hotels. Suitable for dry conditions IP20. Warranty 2 years. LED wall light AVVA-WL01, 8W, square, 220VAC, 400lm, 3000K, warm white, IP20, non-waterproof, BH07-03101, black Black, square shaped LED wall fixture light AVVA from Braytron is with 8W power consumption, 400lm light output and gentle warm white light. This type of wall fixtures are very suitable for interior and decorative lighting at home, hotels, lobbies, entrance halls, business and fashion buildings. Warranty period of 2 years. LED Ceiling lamp JADE, 20W, 220VAC, 1280lm, 3000K, warm white, IP44, waterproof, 260x260mm, BH15-03100 The Braytron PLUS series presents an innovative LED light with a modern and stylish design. 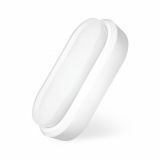 It has low power consumption that makes it the ideal replacement for traditional incandescent lamps. Waterproof LED ceiling lamp JADE 30W, square, 220VAC, 2060lm, 3000K, warm white, IP44, 330x330mm, BH15-03200 White LED dome light in square shape JADE with wattage 30W, protection degree against moisture IP44, luminous flux 2060lm and warm white lighting 3000K. Suitable for indoor (bathroom, WC) and outdoor areas such as balcony, gardens, decks. Non-dimmable. LED Ceiling lamp JADE, 20W, 220VAC, 1280lm, 6500K, IP44, waterproof, 260x260mm, BH15-03130 Braytron introduces the new, enhanced and expanded range of LED lights in its premium PLUS series - with a range of updated features, the LED lamps PLUS series have high quality, outstanding design and extended warranty periods. Waterproof LED ceiling light JADE 30W, square, 220VAC, 2060lm, 6500K, IP44, cool white, 330x330mm, BH15-03230 White LED dome light in square shape JADE with wattage 30W, protection degree against moisture IP44, luminous flux 2060lm and bright, cool white lighting 6500K. Suitable for indoor (bathroom, WC) and outdoor areas such as balcony, gardens, decks. Non-dimmable. 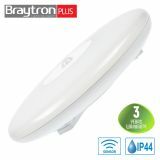 Horizontal LED wall light AVVA-WL03, 8W, 220VAC, 400lm, 3000K, warm white, 210mm, BH07-03200, white Contemporary LED interior sconce for wall mounting AVVA from Braytron is with 8W wattage, 400lm brightness and gentle, warm white lighting (3000K). Ideal solution for decorative lighting for home, office area, galleries, coffee shops and restaurants. For indoor use only. Beam angle 90°.Warranty 2 years. 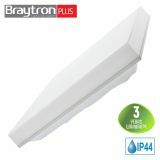 LED wall light AVVA-WL03, 8W, 220VAC, 400lm, 3000K, warm white, 210mm, BH07-03201, black Contemporary LED wall sconce AVVA from Braytron with 8W wattage, 400lm brightness power and preacefull, warm white lighting. 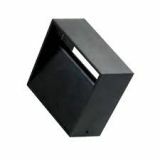 Ideal wall lamp for accent and decorative lighting for bedrooms, corridors, stairs, hotels, and office area. Indoor use only. Long life up to 20 000h. Manufacturer warranty 2 years.